Senior living should make life easier. Plain truth? Some days, there’s nothing better than relaxing inside and taking it easy. Other days, all sorts of adventures beckon and there’s no place you’d rather be than out there, engaged, involved and busy. So make yourself right at home at Kalispell’s Immanuel Lutheran Communities, where residents enjoy a variety of senior living options, the right level of care, and the lifestyle they crave. LEARN MORE ABOUT OUR COMMUNITY. LEARN MORE ABOUT OUR EXPANSION. It’s easier to make a decision about your future if you have all the information available. 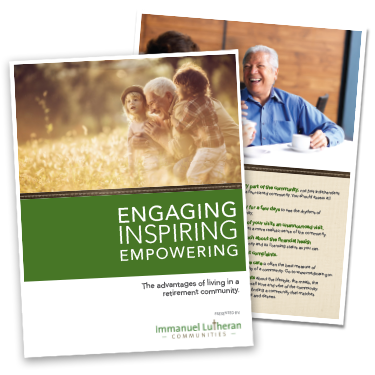 Download our interactive workbook packed with helpful insights to give you an insider’s perspective to finding the right community. Independence comes naturally at Buffalo Hill Terrace, with comfortable, amenity-rich, easy senior living. And with the 2018 expansion to our independent living community … the Villas for those who prefer these slightly larger apartment homes. Explore our continuum of senior health services and discover how much we genuinely care. Expanding our campus so we can better serve Flathead Valley seniors. Phases I and II of our expansion are now complete! These phases included the renovation of The Retreat and the opening of The Villas. Phase III will bring more renovations to our Immanuel Skilled Care Center. View the latest news and updates on our expanding campus. The Villas, beautiful senior retirement homes with peace of mind for the future. With all of the decisions you need to make in choosing a senior living community, we want to make sure you and your family have all the information you need. Fill out the form to the right, and ask us anything. Our team will be in touch shortly.